ChouMag Grate Magnets in Housing effectively remove ferrous fragments and fines from free-flowing material. They are designed for ferrous metal separation in a wide variety of dry processing applications. 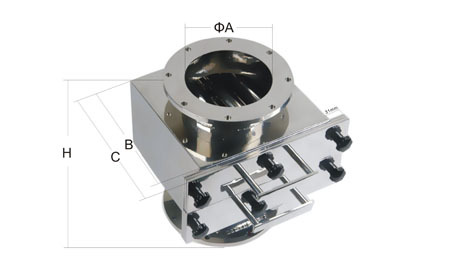 Housings are constructed 304 or 316L stainless steel. Wild stainless steel can be provided on request. Strong magnetic grates inside filter the flow and extract the unwanted ferrous metal. They are widely used in food industry and chemical industry. Inside the housing, it can be one layer, two layers or more layers high intensity magnetic grates in frames. To initiate cleaning, the operator pulls two handles on the front of the housing, removing the magnetic drawer from the product flow. As the drawer is pulled out, you can wipe off the accumulated metal from the tubes into a catch box for disposal. 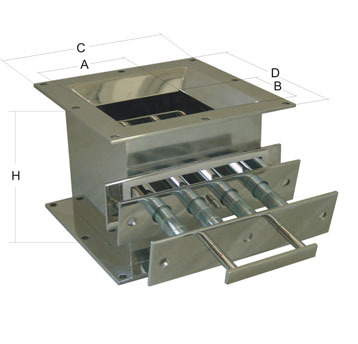 The easy-clean version grate magnets in housing are designed to simplify the cleaning process to encourage frequent and quick removal of collected tramp metal. Cleaning of the magnets is easily accomplished by removing the tube casing of the grates and sliding out each magnet assembly. It is equipped with high-energy Rare-earth Magnets. Diameter of magnetic bar is 1". All of magnetic bars are waterproof. Optional for Easy-clean version or manual cleaning version.